These high-speed SU640SDWH and SU640SDWHVis InGaAs room-temperature 640 x 512 pixel solid-state cameras allow users to capture full-sized images at 109 frames per second (fps) or smaller Regions of Interest (ROI) at over 15,000 fps. These cameras feature a Camera Link ® compatible interface and internal non-uniformity corrections for the full-frame operational modes. 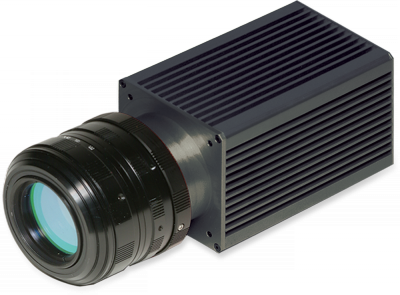 The 640SDWH camera’s focal plane array responds to light within the shortwave infrared (SWIR) spectrum range of 0.9 to 1.7 μm while the SU640SDWHVis includes the visible, covering 0.4 to 1.7 μm. Instructions: adjust the number of rows and columns to determine the maximum frame rate for a given window. Max frame rates are estimated, actual results may vary. This calculator does not contain any export controlled technical data. Contact Us to discuss your windowing needs. The International Traffic in Arms Regulations (ITAR) details the regulations governing the export of defense related materials and technologies. The U.S. Munitions List (USML) categorizes goods and technologies governed by the ITAR. This product is available for sale outside the United States to approved end users subject to receipt of an approved export license. Export of this product from the United States is strictly prohibited without a valid export license issued by the U.S. Department of State, Office of Defense Trade Controls as prescribed in the International Traffic in Arms Regulations (ITAR), Title 22, Code of Federal Regulation, Parts 120-130. Violations of the ITAR are extremely serious and can result in fines, debarment, and criminal sanctions. Please direct any questions or concerns regarding the export status of your Sensors Unlimited product to our Sales/Export Compliance Traffic Manager, at 609.333.8200 or email us at sui_info@utas.utc.com. Please visit our regulations page for more information around ITAR regulations and the export of Sensors Unlimited products.